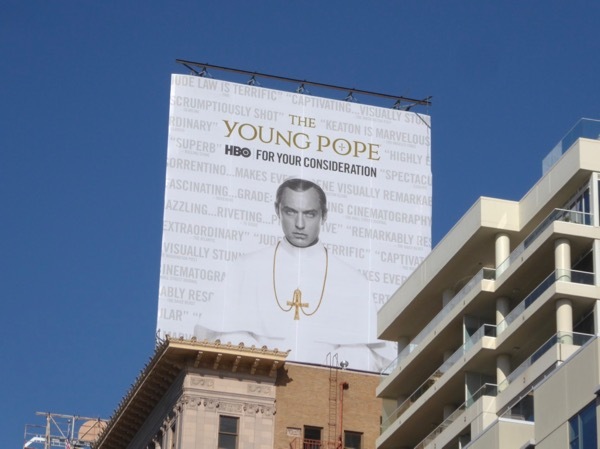 Of late it seems that HBO is loving limited series, with everything from The Night Of to Big Little Lies and its new ecclesiastical offering, The Young Pope. 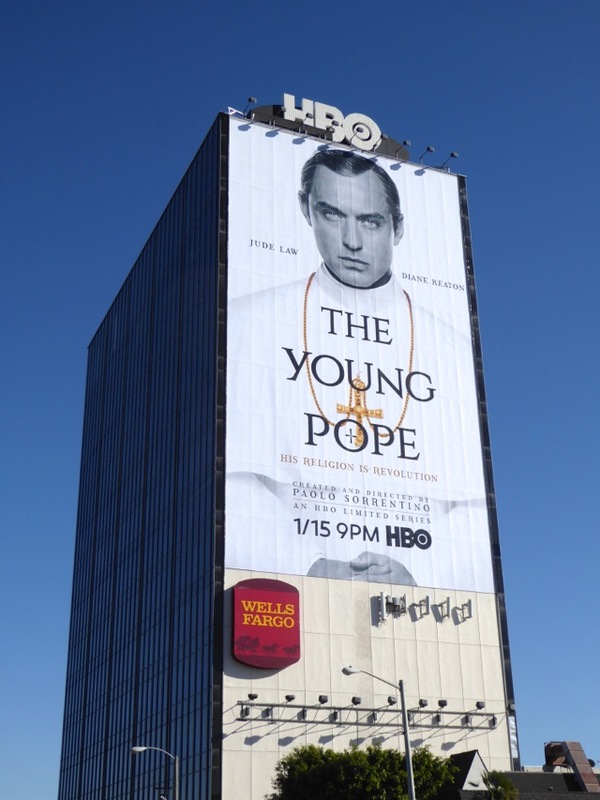 The ten-episode series from Italian creator and director, Paolo Sorrentino, sees Jude Law playing the controversial first American Pope, Pius XIII (even more contentious considering the actor is British). 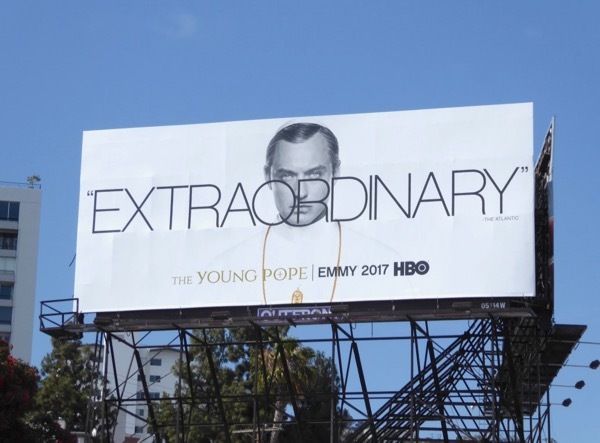 Diane Keaton stars alongside the very young Pontiff as an American nun now living in Vatican City, as the series examines what it's like to the the Head of the Catholic Church and the duties, power, struggles and faith the role entails. 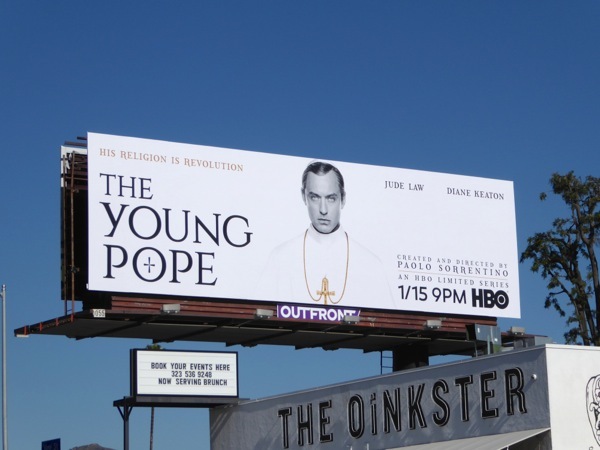 These arresting standard landscape billboards were first spied along Vine Street and Sunset Boulevard from December 17, whilst the giant-sized version was photographed towering over West Hollywood's eastbound Sunset Strip on December 27, 2016. 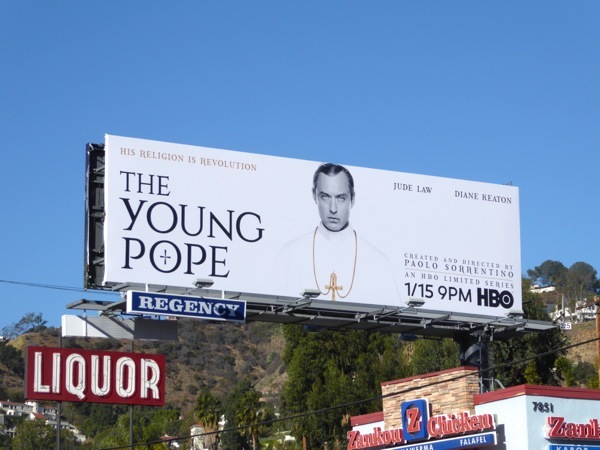 Meanwhile fans of Jude Law can also check him out in these Sherlock Holmes movie billboards and these Contagion film billboards. 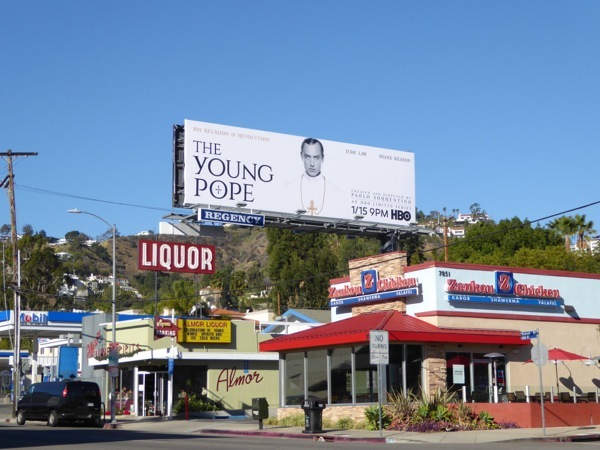 For more ad creatives featuring nuns and other members of the clergy, you can also check out this movie billboard for The Devil Inside, this film billboard for The Town, these American Horror Story: Asylum billboards and these billboards for The Borgias TV series. 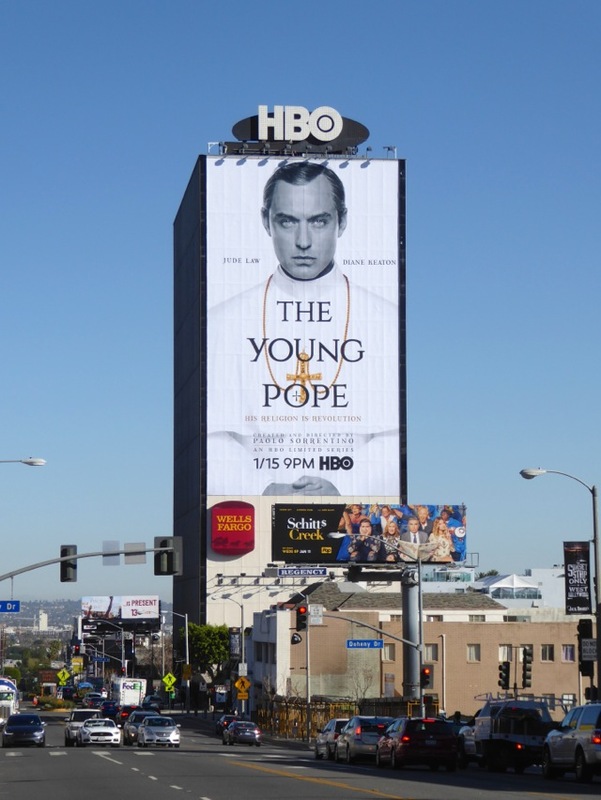 The Young Pope has already aired in the U.K. and Italy to great acclaim, so Daily Billboard is sure HBO is praying that the series will receive the same adoration stateside. 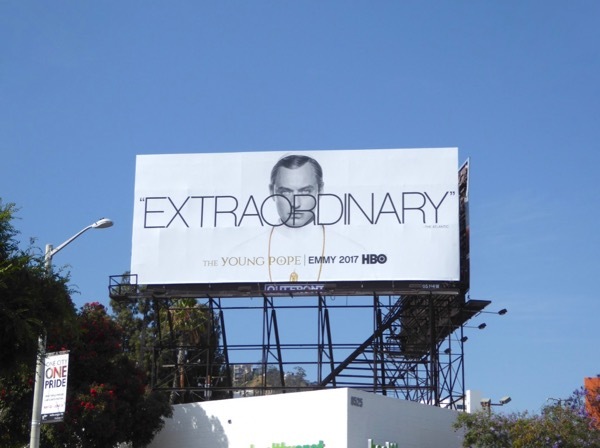 UPDATED: Here's also the Emmy consideration billboard for this 'Extraordinary' show photographed along West Hollywood's Santa Monica Boulevard on June 8, 2017. 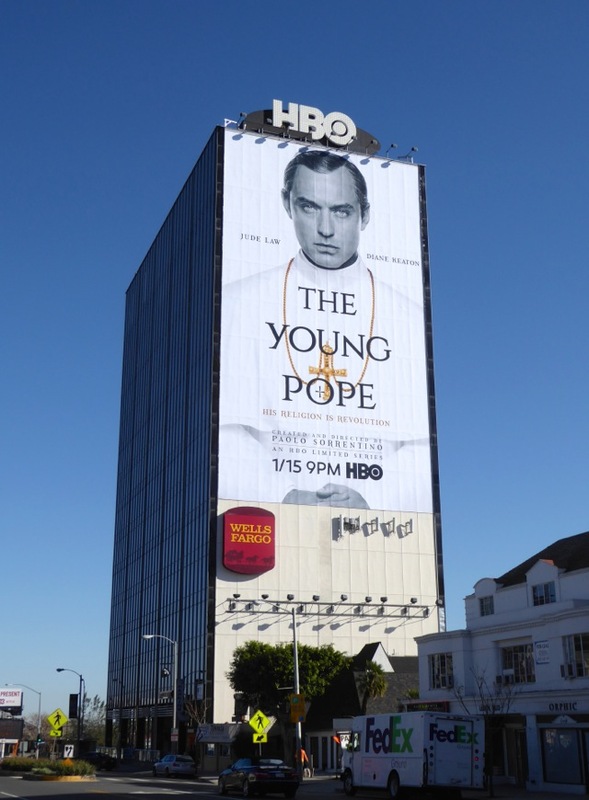 Now let's see if the HBO series will be blessed with any industry accolades this award season. 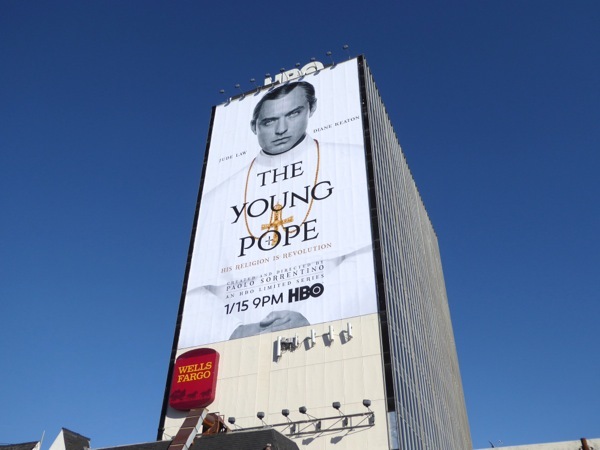 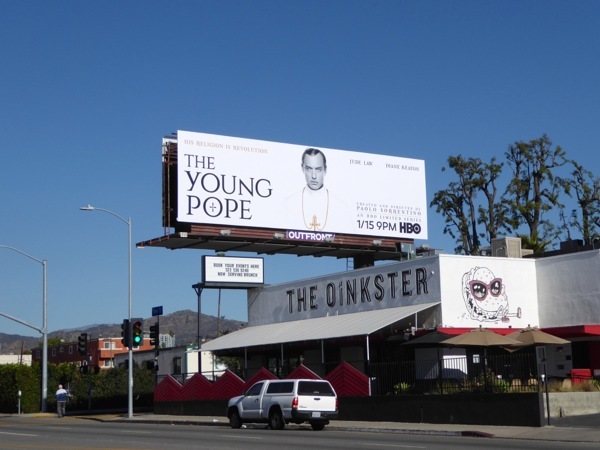 UPDATED: The Young Pope nabbed two Emmy nominations but no wins, so can this consideration billboard snapped high above Hollywood's Vine Street on November 17, 2017, help the series garner any Golden Globes or other industry accolades this awards season?